This article describes in detail what Search Presets are and how to configure them for optimal use. 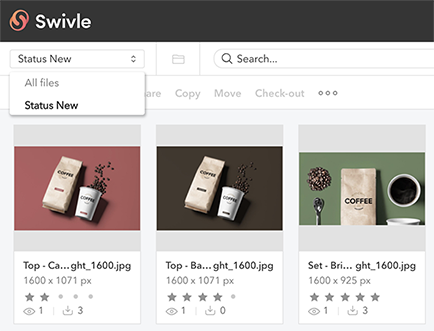 Working on assets in Swivle starts by searching for these assets. Some assets are searched for on a regular basis, such as those in a particular location, with a particular status, and so on. The search criteria for finding these assets can be made available by the system administrator in the form of a Search Preset. These appear in a list in front of the Search box of the Pro client. This way, users can quickly access the assets by choosing the preset instead of having to enter or be aware of the search criteria themselves. This article explains how to manage Search Presets. Managing Search Presets is done by using the Management Console and requires an account with admin credentials. Search Presets can only be assigned to user groups, not to individual users. Make sure therefore that user groups have been set up. Managing Search Presets is done on the Groups page in the Management Console. Step 1. Access the Search Presets page (see above). Step 3. 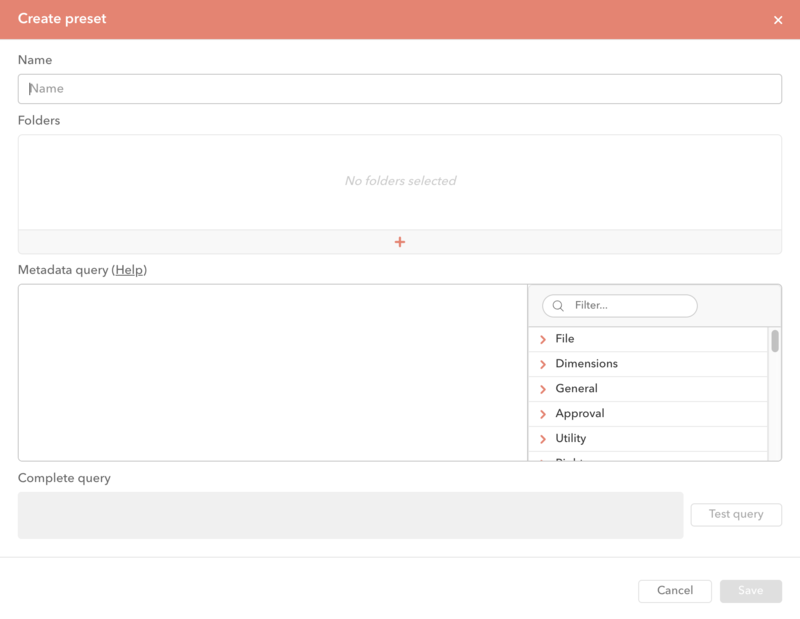 Set up the Preset by entering a descriptive name and defining the search criteria by specifying a folder where the assets are located and/or by defining a metadata query. Enter your query in the Metadata query box. Tip: Quickly locate metadata fields to include by searching for them in the Fields overview list. Clicking a found field will automatically add it to the Query box. For information about constructing queries, see Swivle query syntax. Note: Using wildcard queries is not supported; these slow down searches too much and will affect every search done on the system. Step 4. (Optional) Test your Rule by clicking Test query. The Pro client will open in a new tab and the search is run. The Search Preset is added to the list. Before a user can use a Search Preset, it needs to be assigned to a user group. Note: The system administration who has created the Search Preset always has access to it, regardless of the groups that the Search Preset has been assigned to. Step 2. From the list of user groups, select the user group to which the Search Preset needs to be assigned. Step 3. From the list of presets, select the Search Preset that needs to be assigned to the group. Step 2. Click the Edit icon for the preset that you want to edit. Step 3. Make any changes and click Save when finished. Step 3. Click Delete Preset in the lower left corner and confirm that you want to delete the Search Preset.